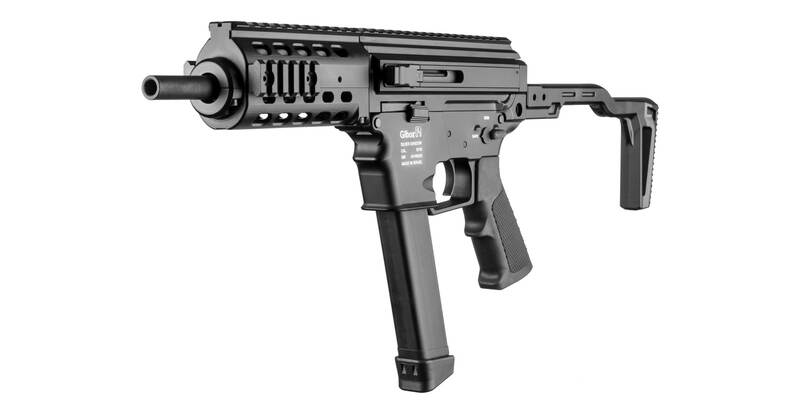 The Gilboa ®9mm gun compliments the Gilboa® family by adding more versatility. operators requiring 9mm characteristics can transition between their AR type main weapon and the 9mm SBR without extra training as the Gilboa 9mm retains the same handling and familiarity of their main weapon and at the same time, using the common Glock type pistol magazine enables using this same magazine in their side arms to complement reloading, magazine sharing and use existing web gear configured for their pistols. Using the Gilboa® 9mm will cut down training time and cut logistical costs due to the commons parts for maintenance and magazines offered by many name brand and OEM companies. Gilboa ® 9mm can be used with 10/15/17/32/50/100 rd. magazines and drums. The Gilboa® 9mm gun utilizes the propriety APR design that allows for a Detachable folding stock on the AR platform and firing like a pistol with the stock detached.